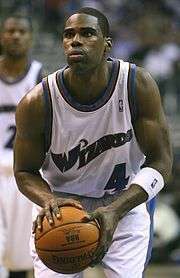 Antawn Cortez Jamison (/ˈæntwɑːn/; born June 12, 1976) is an American retired professional basketball player who played 16 seasons in the National Basketball Association (NBA). He played college basketball for the North Carolina Tar Heels, when he was named national player of the year in 1998. He was selected by the Toronto Raptors in the first round with the fourth overall pick of the 1998 NBA draft before being traded to the Golden State Warriors for former Tar Heel teammate Vince Carter. Jamison was named to the NBA All-Rookie Team with the Warriors. 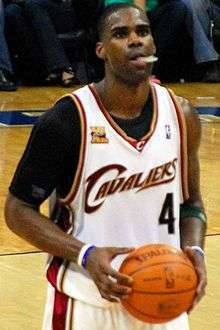 During his career, Jamison was a two-time All-Star and won the NBA Sixth Man of the Year Award in 2004. He was a member of the United States national team in 2006. After retiring from playing, he became an analyst for Time Warner Cable SportsNet. Jamison was born in Shreveport, Louisiana. His first name was misprinted as "Antawn" instead of "Antwan" on his birth certificate, with pronunciation as though it were spelled "Antwan" or "Antoine". Jamison played basketball and football (as a quarterback) at Quail Hollow Middle School in Charlotte, North Carolina. He went on to play high school basketball at Providence where he was named a McDonald's All-American after his senior season. Jamison played three seasons of college basketball for the University of North Carolina at Chapel Hill, averaging 19.0 points and 9.9 rebounds per game. In his junior year, he was awarded both the Naismith and Wooden Awards as the most outstanding men's college basketball player for the 1997–98 season. Jamison decided to forgo his senior year of eligibility and enter the NBA draft in 1998, thus ending his college career. On March 1, 2000, Jamison's #33 was retired at the Dean E. Smith Center. He became only the seventh North Carolina basketball player to have his number retired. At North Carolina, Jamison majored in Afro-American and African studies and earned his B.A. in August 1999. On February 17, 2010, Jamison was traded to the Cleveland Cavaliers as part of a three-team, six-player trade that sent Al Thornton from the Los Angeles Clippers to the Washington Wizards, Žydrūnas Ilgauskas, a 2010 first round pick and the rights to Emir Preldžič from Cleveland to Washington, Drew Gooden from Washington to Los Angeles and Sebastian Telfair from Los Angeles to Cleveland. In his first game with the Cleveland Cavaliers against the Charlotte Bobcats, Jamison scored only two points from two free throws as he went 0 for 12 from the field. In his second game with the Cavaliers, Jamison scored 19 points against the Orlando Magic. The Cleveland Cavaliers made the NBA playoffs as the team with the best record. The Cavaliers defeated Derrick Rose and the Chicago Bulls in five games, but fell to the Boston Celtics in 6 games. Weeks after the series, Jamison's teammate LeBron James left the Cavaliers, to join the Miami Heat alongside Dwyane Wade and Chris Bosh. Antawn Jamison and the Cleveland Cavaliers had very little success in the 2010–11 NBA season. They would set NBA history with a 26-game losing streak (previously set by themselves in 1983). That streak was finally snapped with a 126-119 overtime win against the Los Angeles Clippers. 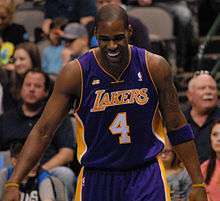 In January 2011, Jamison said that he was considering retirement, and that his 2011–2012 season could be his last. On February 27, in a loss to the 76ers, Jamison was fouled and broke his left pinky. He underwent a surgery, and would be out the rest of the season. He finished his 14th NBA season in 2011–12 with averages of 17.2 points and 6.3 rebounds. On August 28, 2013, Jamison signed with the Los Angeles Clippers. On December 11, 2013, in the second quarter against the Boston Celtics, Jamison scored a 3-pointer which took his career points tally past the 20,000 mark becoming just the 39th player in NBA history to achieve this. ↑ Joseph, Bob (January 3, 2007). "Tar Heel Pros News & Notes". Inside Carolina. Scout.com. Retrieved June 30, 2011. ↑ Heyman, Bob (June 2, 2005). "Why Search Is the Antawn Jamison of Marketing". MediaPost. Archived from the original on February 16, 2009. Retrieved June 30, 2011. ↑ "About Antawn". AntawnJamison.com. Archived from the original on 7 July 2011. Retrieved June 30, 2011. ↑ "Charlotte Royals Hall of Fame". Charlotte Royals. Retrieved June 30, 2011. ↑ They got game, but do NCAA players graduate? ↑ 2006 USA Basketball Archived August 27, 2007, at the Wayback Machine. ↑ "Wizards Acquire Ilgauskas, Thornton and First-Round Pick In Three-Team Deal". NBA.com. February 17, 2010. Archived from the original on 19 February 2010. Retrieved February 17, 2010. ↑ Tomasson, Chris "Antawn Jamison Says Next Season Could Be His Last", FanHouse, January 16, 2011, accessed January 18, 2011. ↑ "Cavs' Jamison has season-ending surgery on finger". NBA.com News. 1 March 2011. Retrieved 31 March 2012. ↑ McMenamin, Dave (July 13, 2012). "Source: Lakers target big men". ESPN. Archived from the original on July 16, 2012. ↑ "Antawn Jamison Stats, News, Videos, Highlights, Pictures, Bio". ESPN. Archived from the original on December 1, 2012. ↑ Medina, Mark (December 30, 2012). "LAKERS NOTEBOOK: Jamison apologizes for comments about reduced minutes". Daily News. Los Angeles. Archived from the original on January 3, 2013. ↑ McMenamin, Dave (January 4, 2013). "Rapid Reaction: Clippers 107, Lakers 102". ESPN. Archived from the original on January 7, 2013. ↑ McMenamin, Dave (January 6, 2013). "Rapid Reaction: Nuggets 112, Lakers 105". ESPN. Archived from the original on January 7, 2013. ↑ Bolch, Ben (January 6, 2013). "Lakers, and Coach Mike D'Antoni, are flunking chemistry". Los Angeles Times. Archived from the original on January 7, 2013. ↑ Pincus, Eric (March 1, 2013). "Antawn Jamison says he and D'Antoni have improved relationship". Los Angeles Time. Archived from the original on March 2, 2013. ↑ Herbert, James (October 7, 2014). "Antawn Jamison becoming Lakers analyst for TWC SportsNet". CBSSports.com. Archived from the original on January 26, 2015.